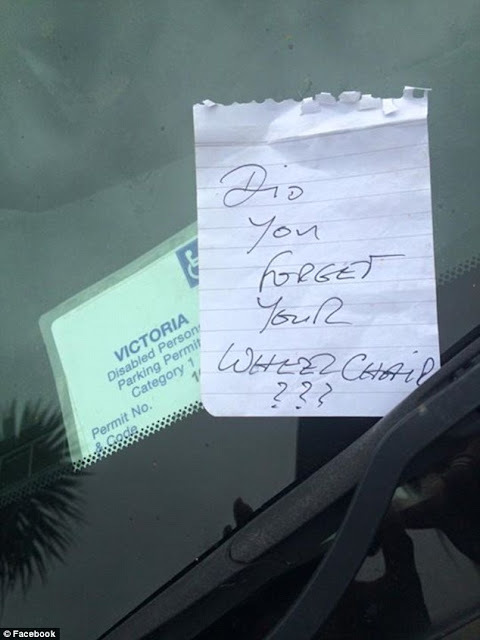 A woman with a debilitating disease had an insulting note left on her car windshield at a shopping centre last week after she parked in a disabled space. Justine Van Den Borne, from Melbourne, has multiple sclerosis. While at Mitcham Shopping Centre with her daughter last week she returned to her car to find an unwanted message. 'Did you forget your wheelchair??? ', the note from a cruel stranger, left just on top of the disability permit, read. 'To person that left this on my car last week at Mitcham Shopping Centre- I was diagnosed with Multiple Sclerosis when I was 35,' a distraught Ms Van Den Borne posted on Facebook on Tuesday. 'Not just MS but the worst one that never goes away and is slowly crippling my life,' she continued. Ms Van De Borne said the day she discovered the note was a 'good' one, where she was able to walk around with her daughter without as much difficulty as normal. 'Thank you for ruining that. You made me feel like people were looking at me, the exact way I feel when I can't walk properly,' the post continued. Hundreds of people have since expressed their support for Ms Van Den Borne, and the post has garnered nearly 5000 comments. Some shared their own experiences, such as a woman who also has an 'invisible' disability and has faced the same discrimination.